I love hymns! – all hymns from all hymn books! It’s amazing what power and peace come from hymns. I encourage all piano students, regardless of their faith or religious affiliation, to play the hymns from their hymn book regularly – if not daily. Playing hymns is important. In fact, I think playing hymns helps piano students sight-read faster because they are continually having to read new music when they play the hymns. In addition, playing hymns is a wonderful and effective way for piano students to share their love of music with others. They can give of themselves and enrich the lives of others with their talent of playing the piano. I created the “Hymn Challenge” for myself as a young man. I made a goal to play through my entire hymn book before I left on a two year mission for The Church of Jesus Christ of Latter-day Saints (also known as Mormons). Before I left to spend two years in Brazil (Brasilia), I played through every hymn from our LDS Hymnal (and also every hymn from our Children’s Song Book as well). I originally extended this “Hymn Challenge” to my own piano students, and created an actual completion checklist for them to check off the hymns they had learned, but have since had several piano teachers and other parents ask if they could share this with their piano students. I am in the process of finishing “Hymn Challenges” with the The Hymnal, the Methodist Hymnal, the Baptist Hymnal, the Presbyterian Hymnal, the Worship In Song [Church of God (Seventh Day) Hymnal], and about 6 other religious hymn books. Eventually, I would like to include a hymn challenge for each of the hymn books from Wikipedia’s List of Hymnals. If you know of other hymn books you would like included, please email me and let me know. I am slowly gathering hymn books from various religions and faiths. If you have one you would like to send me so I can create a “Hymn Challenge” for it, please mail me a copy to the address contained in this link. Thank you for being willing to send me a copy of a hymn book. I love playing through all of the hymns and enjoy creating each “Hymn Challenge”. It is this: to challenge everyone, especially all youth, to play through every hymn from their hymn book before they graduate from high school (or its equivalent – grade/age-wise). In addition, I encourage youth to play in church meetings, accompany others as they sing hymns, and perform. If you have already graduated from high school or the equivalent age, give yourself a deadline and play through every hymn from the hymn book. I think piano students can all do this, and I think it helps them tremendously in life. 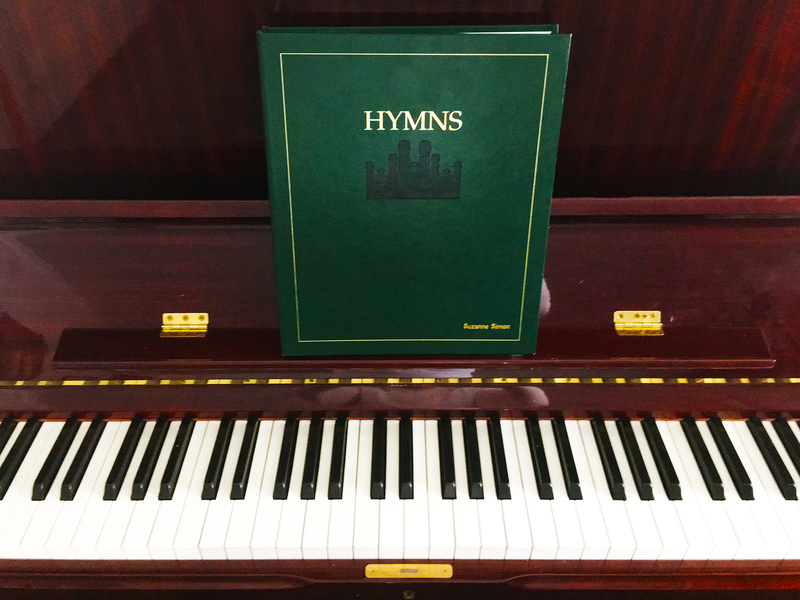 If by the time piano students graduate from high school (or its equivalent – grade/age-wise), piano students will have played through every hymn from their hymn book – they will have sight read every hymn (hundreds of hymns). In addition, piano students will play the hymns they have learned (either for their family, or at their various church meetings). The final part of the Hymn Challenge™ is that piano students will perform at their church in public, playing a hymn arrangement or performing one of the hymns they have learned, on two separate occasions. I believe, from a religious perspective, that learning and playing hymns can have a significant impact on and influence our youth, in particular, for good. As students play the hymns, I encourage them to read the words of the hymns as well. This helps students play the hymns with more feeling and tenderness. Not only can hymns, of all religions, have an extremely powerful spiritual influence on the lives of the piano students who play them, but students learn so many valuable musical lessons as well. Many hymns were created using primarily major third, perfect fourth, and perfect fifth intervals. Left hand patterns often play fifth intervals and octaves. The chord progressions in hymns, for the most part, are very common and simple chord progressions and help piano students understand about blocked and broken chords and their inversions. Students begin to notice patterns, repetitions, and begin to sight read better as a result of playing hymns. All of this may be true of any music form and style, but with hymns, students have a perfect opportunity to share their musical talents with others of their faith at church, in Sunday school, various youth church meetings, firesides, devotionals, and other church related events. It is something they will be able to share with others for the rest of their life. Click on the book covers below to download each individual “Hymn Challenge” for your personal use. Please feel free to make copies of each of these for yourself or your piano students. Many hymns books are in the works and will be finished in the future. To get a general idea of how each “Hymn Challenge” will look, you may click on the LDS hymn book below that has been finished for an idea of how each will look. I will be finishing more hymn book challenges! 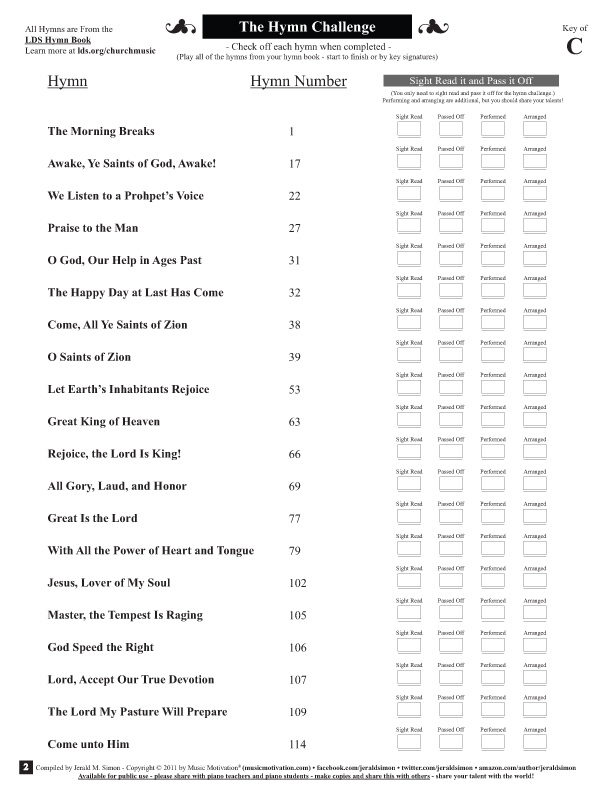 This is what the “Hymn Challenge” for the LDS Hymn book looks like (you can click on the image below to download the FREE PDF checklist and to take the “Hymn Challenge” for yourself! Click on the cover of the various hymn books below to download your FREE PDF copy of the “Hymn Challenge” according to your hymnal (I am currently working on finishing the Catholic hymnal, Baptist hymnal, the Methodist hymnal, and the Church of God (Seventh Day) hymnal). If you have a hymnal you would like to send me, I would love to create a hymn challenge for the hymns in your hymnal according to key signature to help your students have a PDF checklist to challenge themselves. Let me know!